We do our first performance at The Royal Show on Thursday (Sue-Anne's Jeannie Stage Show) so we went over there to check out the stage today. 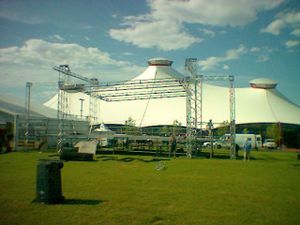 The entire Showgrounds have been revamped and they really look good, our stage was still under construction and it just looked big. 1.5 metres off the ground and about 8 metres tall. It's yet to have a backdrop, sides and a roof put on it... and lights and sound added too, so all we'll say at this stage is... it's big! This is the first time in years we've done outdoor shows and the first time in maybe 13 years I've worked at The Royal Show. Today has been exceptionally windy, and hot. Hopefully the weather will be on our side on Thursday, (we don't want the Floating Table floating away over the horizon). We'll keep you informed!